Offering you a complete choice of products which include high speed flex printing machine, solvent based inkjet printers and high speed solvent printer. We are offering High Speed Solvent Printer with Latest High Speed Konica 1024i Prints Head to Produces arround 24000 Sqft per day. 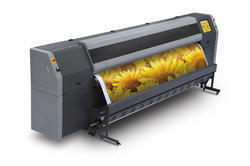 Being a well-recognized enterprise in the printing industry, we are offering products matching modern lifestyle such as High-Speed Solvent Printer that is often demanded in the market.